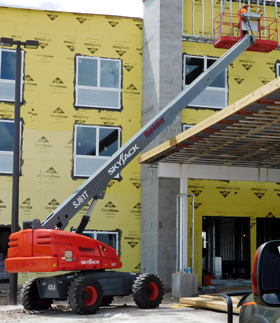 Built and designed using Skyjack’s robust and reliable design philosophies, the new Skyjack SJ61T Telescoping Boom Lift continue to offer the lowest life cycle costs, proven reliability, and ease of serviceability. Superior terrainability is obtained utilizing Skyjack’s exclusive axle based 4WD system which features a “Detroit Locker” type rear differential and limited slip front differential. Other competitive advantages include an innovative and intuitive direction sensing drive and steer control system as well as a 45 degree steering angle which results in the industry’s tightest turning radius. 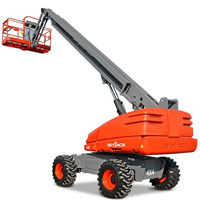 Skyjack’s standard color coded and numbered wiring system, along with proven relay based controls, complete a well rounded package of superior, proven, operating characteristics.